I always get so excited when I learn something about Yeshua (Jesus)! Especially when it comes in such a way that takes me back and teaches me as if I were right there with Him as He grew and “learned” while He was here as a wee one through young adulthood. You see, Yeshua (Jesus) was a Jew. His language was Hebrew/Aramaic. This was the language His Father in heaven willed Him to learn to write and speak in. The Father never does anything without specific purpose and profound meaning! I recently learned that the 119th Psalm was broke up into sections and each section represented the letters of the Hebrew alphabet. So Yeshua likely learned this Psalm in conjunction with learning His letters! I thought it would be fun to do each section and correspond the letter here and give a taste of what it may have been like to sit next to our Shepherd as He learned how to spell His name :-). How happy are those who observe His instruction, who seek Him wholeheartedly! They do nothing wrong but live by His ways. You laid down Your precepts for us to observe with care. May my ways be steady in observing Your laws. Then I will not be put to shame, since I will have fixed my sight on all Your mitzvot (commands). I thank You with a sincere heart as I learn Your righteous rulings. I will observe Your laws; don’t completely abandon me! 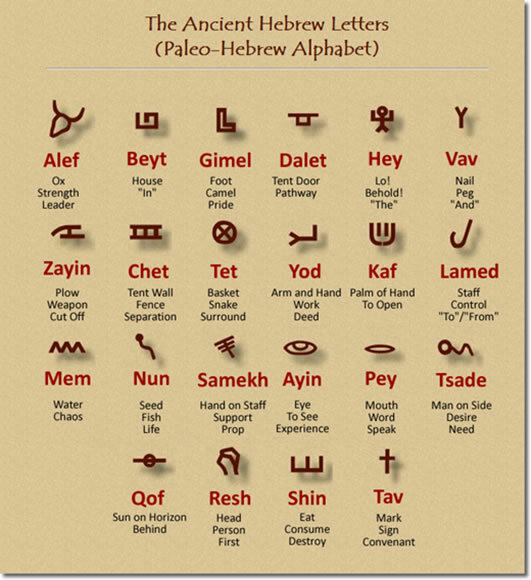 As seen on the chart above; Hebrew is a language that in everything it can be “seen”, touched, felt. The Ox was a strong representation it also led in work. It also represents the Father of the home because it is the strength of the house. Likewise if the father did not lead, he became the opposite, the weakness of the home. The Father of all, is perfect strength, always leading, guiding instructing, with the motive of protection and love. Also of note: that all of scripture is taught in the Jewish tradition that it represents God’s character. All of it! In Hebrew the word name means character. So Yeshua, as He learned by the Word literally did learn to write His name with every word in The Word, as He learned it. Taking the Word of God in as through Yeshua’s eyes allows us to know Him more fully. Also of note: each Hebrew letter also taught the numbers. Aleph in Hebrew is also the number 1. Which is so significant as a young mind learns in this culture the Shema, Hear, O Israel, the Lord our God, the Lord is One. ancienthebreworg. This gives brief little videos of each letter (so far he has got to Gimmel). But every video will open your eyes to your Savior Jesus in ways beyond knowing :-). This website has the best resource for the Biblical meaning of numbers. Also of note: I am not a believer in numerology. This site does not endorse such. Nor can I speak or read Hebrew fluently much less minutely. These resources are helps in word study and meaning such as the “mind-set” behind the culture and language. I am not setting this up to “teach” Hebrew, as I am neither qualified, nor can. Hence the resources I am giving. I trust them, and my own relationship with Yeshua, the Father, and the Spirit has soared in using them. May God bless all your endeavors to know Him more!